At was a Michael's the other day and picked up these 1 1/2" wood disks. 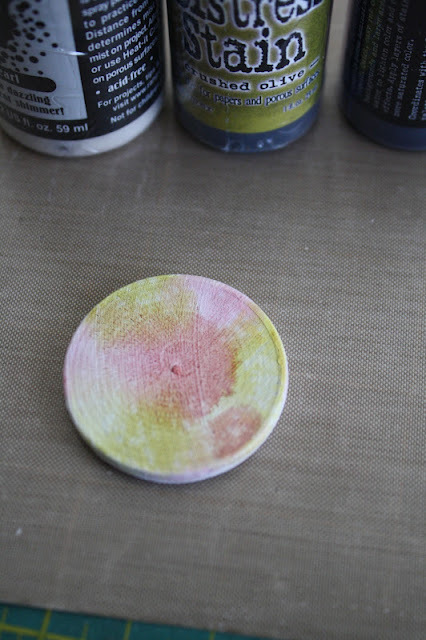 I decided to use some of the Distress Stains to color the disks. Ranger makes so many colors of Distress stains (like 37!) that it was hard to choose which to use. I decided that since I bought the "value pack" of disks (22 pieces for $2.99) I had the freedom to color away. You can see in this shot of the Distress stain oranges that each is very different. Spiced Marmalade is a go-to favorite. Crushed Olive and Broken China are two must haves for this project. Put these two with Spiced Marmalade...good stuff. I found that the color goes on dark and lightens as it dries. Some colors changed a bit when added to the wood for instance, Tumbled Glass is much greener than what I thought it would be. Push down on your craft mat and squeeze just a bit to let the Distress Stain flow to the top of the felt top. As it dries, the stain seeps into the wood and the color will start to lighten and change. 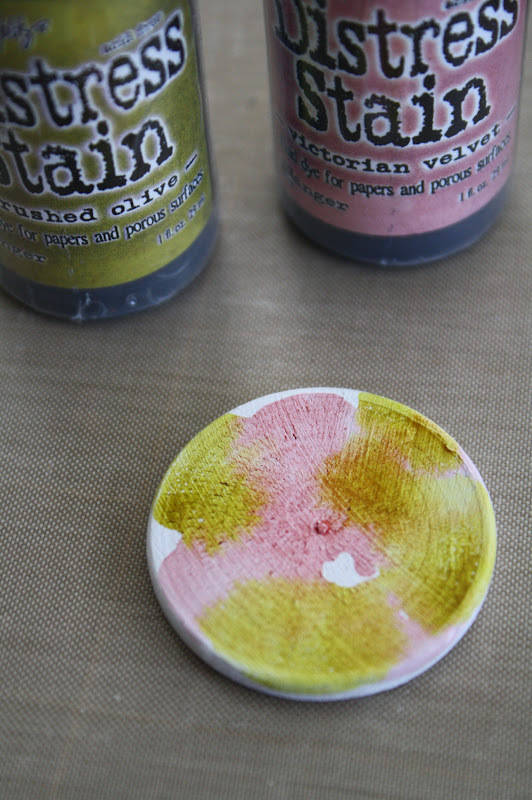 Depending on the intensity of the color you can leave as it or add more stain. 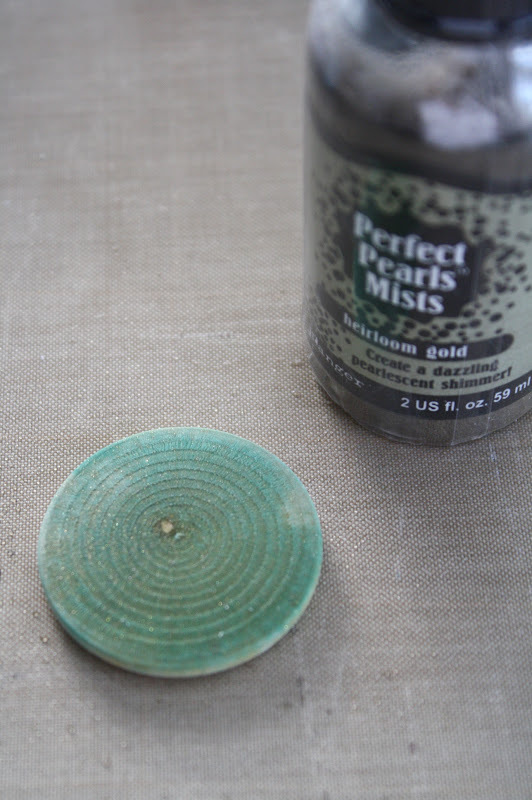 I sprayed the disk with Perfect Pearls Mists - Heirloom Gold and let it dry again. I only needed one butterfly so I just inked one. To be honest I never even used an acrylic block during any part of todays tutorial, I just used my fingers to press the stamp down. Here is the same process using Dried Marigold. Two coats made for a good carrot orange. The top image from the same stamp is also a favorite. 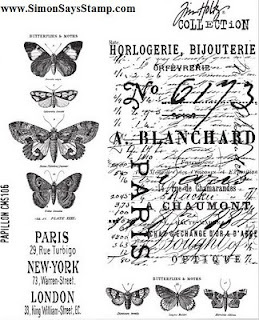 Love that it has the word butterflies in tiny, tiny type at the top. Here are some others I made using more of Tim's stamps. Okay, so after coloring more than half of the disks I decided to paint some white to see what the Distress stains would do on different surface color...could the Distress Stain stay more vibrant? 3. Normally you push down on the pin that is in the top of the bottle on a craft mat, then wipe the color on your surface. For this project I pushed the pin down right on the disk...the lines will go away in a future step. You don't even have to cover all the white. This time I used Perfect Pearls Mists in Perfect Pearl for a bit of shine. When you add the mist it reactivates the Distress Stain making it bleed. You can pick up the disk a swirl it or leave as is. 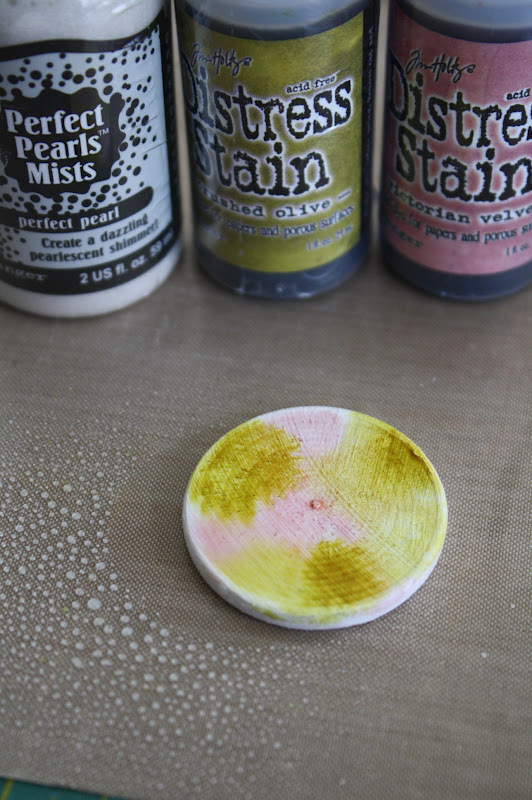 As it dries, the stain becomes lighter just like the first disks. This time I used the other smaller butterfly stamp on the Papillon stamp set. Remember to always use Archival ink because its waterproof . That way, if you want to add more color or Perfect Pearls mist you can, without the ink from the stamp running. Then I just started I mixed different colors...blue and purple, pink and green, blue and gold, etc. This is really kinda addicting. I am going to need more disks. Another thought...how about adding Glossy Accents to to make it look like really finished. It takes a couple hours to dry but it's worth the wait. The color is fabulous. Here are some other disks I added the Glossy Accents to. I know you are going to want to know about the stamps...the words are from the Papillon set and the very cool numbers are from Ma Vinci Reliquary. The numbers are part of this unmounted set, Antique RSM alphabet. The cap letters are 1" tall and the numbers are 3/4" tall. The set sells for $32.00 and is unmounted, meaning you have to purchase cling mount foam to be able to use it. So one step further...what if I want to make a jewelry piece? Then I think we need to make it look like an expensive soldered piece. To do this I just used Memory Foil tape in silver. Just start wrapping around the edge with the tape. Then use a bone folder to burnish. Cool, right? By the way, you can put a hole at the top for a jump ring with a good wood awl, no problem. The whole idea of making the disc's into a necklace was spurred on by this picture I have had saved since I saw it online as part of Elizabeth Taylor's jewelry that was auctioned at Christie's in New York, last Sept. 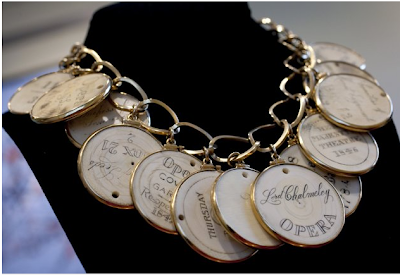 The gold and ivory necklace is made from opera passes, circa 18th and 19th centuries. Can you imagine how heavy this necklace would be? The necklace was a gift to Elizabeth from the estate of Edith Head, the famed costume designer. I have been secretly obsessed with the idea of this necklace from the genius idea of making the opera passes into a necklace, to the exquisite fabrication, to the fonts used. I didn't even know there were such things as opera passes as keepsakes. By the way, the necklace sold for $314, 500. Now, by no means are the simple wooden disc's I made anything to compare to this necklace. It's just the idea of the disc's becoming more than simple wood pieces. I guess what I'm trying to say is, "Think outside the craft department". If you would like to read more about the Elizabeth Taylor collection you can find it here. I learned a lot doing this tutorial today. 1. I love how one idea can lead to another...building till you get something really fun and cool. 2. I think these will need to be incorporated into a class or kit this year. 3. I now know how to spell papillon without looking it up. Now if I can only get aisle and restaurant down I should be good. WOWEE! I must try this - it was pretty before you stamped but the stamps, man, just makes this come to life and then the foil tape - incredible! These are just awesome! Really pretty, I like how you play!! What a fantastic tutorial/idea! Darn the luck, i just went to Michaels today. Oh well, another excuse to go back :). Thanks so much for sharing! This was really interesting - I enjoyed watching all the different processes. Thank you! Thank you for yet more inspiration. Off to Michael's tomorrow. Just love these. Really neat project to try. Love the look of them. After seeing yours I like them better than the gold and ivory necklace. It looks like it could use some glossy accents. ok....oh my gosh..... how come I don't live closer to you? I LOVE tims distress stains and you just inspired me to a whole new level... like seriously? wow! Soooo cool!! Thank you for sharing, what a neat idea and I love how the disks turned out! I don't care for Liz Taylor's necklace, but I love what you did with the wooden discs. They look gorgeous. Thanks for the great pics too, they really help. Thank you so much for sharing this fabulessness! 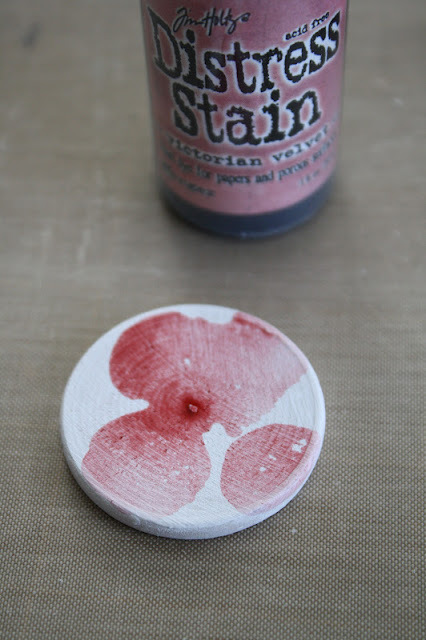 I love distress stains & now I have another way to use them. Love what you've done. Thanks for sharing a fab tutorial! So I've got about a boat-load and a half of chipboard circles AND squares. I can see this being my art therapy project for the day! And for my parting shot...St Pete, sunshine, warm chocolate chip cookies, Whim So Doodle! Very creative! Love the Glossy Accents on the disks. Paula, I love this idea…I love how you showed the process of experimenting you went through. Might have to make a few myself. Awesome!! Thanks for showing the burnishing idea for a metal look! Wow, love yours more than Liz's...what a great idea!! OMG! I love this project!! and cheap too!! Love it. I used Claudine Hellmuth/Ranger White paint to paint the disk. I like it because it is a one coat paint for most things. I think most acrylic will work, you just might need more than one coat. Thanks Paula for that info. I finished a project with this as a jumping off start.I would be happy to get a picture to you, if you would like. I don't have a blog. I'd love to give these a try...thanks so much for sharing the tutorial with us! 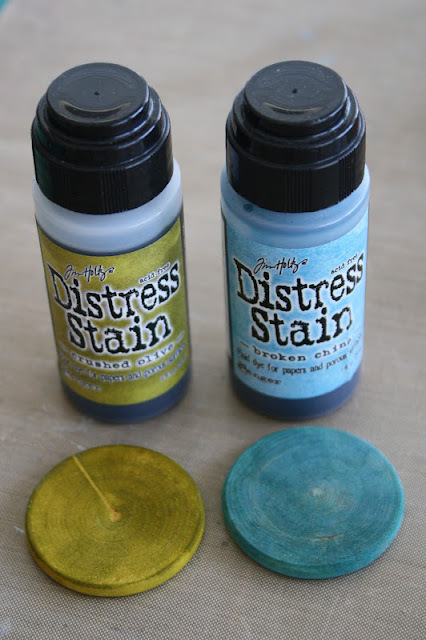 I bought the Distress Stains online, because you are right...they are not at Michaels. I usually use Blue Moon or Simon Says Stamp. I bought the discs at the Santa Maria Michaels but now they are gone. So now I am looking for them online too. i am just ooogling over this process!!!! thank you for sharing it! i have bookmarked your blog! I love this. I have really enjoyed going through all your projects since I discovered you on Pinterest! This project gave me an idea for a photo display. I used your idea of stamping the discs. I am writing a post about it and am going to link back to your site so everyone can see what you did after you stamped the discs. I stopped there with mine and went in another direction. Thanks for the inspiration!! !